The health benefits of exercise are endless. According to the U.S. Department of Health and Human Services, physical activity is one of the most important things you can do to improve your health. It can help prevent cancer and decrease your risk of everything from heart disease and stroke to high blood pressure, type 2 diabetes, depression, and even dementia. And that’s just the beginning. Exercise is also one of the keys to maintaining a healthy weight. Plus, it can sharpen your focus, boost your mood, reduce stress, and improve your sleep. Of course, setting aside time for exercise can be tough. 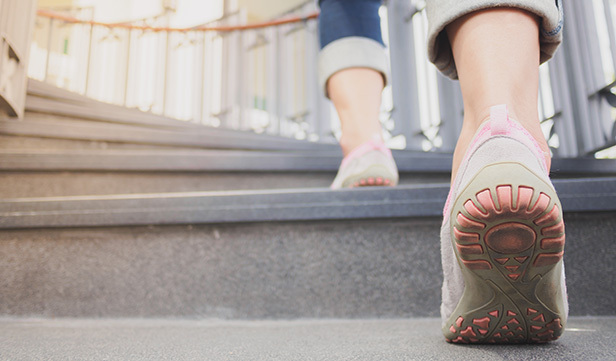 With long workdays, slow commutes, errands, and never-ending household responsibilities—not to mention spending time with loved ones and getting enough sleep—it’s no wonder that only about one in five adults gets the recommended amount of exercise. But even if you think you’re too busy to exercise, there are ways to sneak physical activity into your life. The U.S. Department of Health and Human Services developed the Physical Activity Guidelines for Americans to help people like you improve your health through regular exercise. For adults, the guidelines recommend aiming for at least 150 minutes of moderate aerobic activity, along with two strength-training sessions each week. That’s about 30 minutes, five times a week. Anything that gets your heart beating faster counts as moderate aerobic activity. Strength-training just means any activity that makes your muscles work harder than usual. The one thing fitness experts want you to remember is this: Any amount of physical activity has some health benefits. If you have a few minutes, you have time to exercise. So sneaking physical activity into your life is easier than it sounds. Just follow these tips. Rethink the meaning of exercise. We tend to equate exercise with things like running a race, taking a Pilates class, or joining a gym. To get the physical activity you need, you don’t have to do any of these things. Any activity—in any amount of time—counts. It all adds up. Even small bits of activity that don’t feel like exercise can have big health benefits. Turn everyday tasks into physical activity. Housework can get your heart pumping, especially when you take it up a notch. Vacuum the floor, scrub the tub, dust the window blinds. Get outside and mow the lawn with a push mower. Weed the garden. Rake leaves. When you run errands, park at the back of the lot and walk to the entrance. Move more, sit less. That’s the whole idea behind the Physical Activity Guidelines for Americans. If you have a desk job, try to get up whenever you can. After work, invite a friend to go for a hike in a nearby park. Or take the dog for a walk. Get up off the couch. According to MarketWatch, American adults spend more than 11 hours a day staring at screens. For most of us, screen time goes hand-in-hand with couch potato time. But it doesn’t have to. Try riding a stationary bike while watching videos on your smartphone. Keep a pair of hand weights near the TV—and use them. Stretch as you browse social media. During commercial breaks, do some jumping jacks instead of heading to the fridge for a snack. Sneak in exercise at work. If you ride the bus, get off a few blocks early and walk the rest of the way. Skip the elevator and take the stairs. Walk to a co-worker instead of sending an email. Start scheduling standing meetings—which not only offer health benefits but can help keep meetings shorter and to-the-point. Better yet, invite co-workers to take a walk during lunch. You may end up motivating each other to make it a regular thing. Schedule physical activity. Treat your workout like any other important meeting or appointment during the day. If it’s on your calendar, you’re less likely to skip it. No time on your calendar? Set your alarm for 10 minutes earlier than normal and spend that time doing yoga stretches, leg lifts, or chair squats or jumping rope. Keep track. Wearing a fitness tracker can motivate you to reach your health goals. Paired with an app, fitness trackers can count calories, remind you to move, offer exercise suggestions, track your progress over time, and much more. Physical activity can be safe for almost everyone, but ask your doctor or health care professional about the types and amounts of exercise that are right for you. If you have a chronic condition, make sure to discuss it with your doctor. Choose activities that match your fitness level and health goals. If you haven’t been active for a while, start slowly with easier activities. Over time, gradually increase how often and how long you exercise. Use appropriate gear and sports equipment.